congratulations to all of our adopted birds and their wonderful adopters!! The birds pictured below are NOT available for adoption. ~33 year old Crockett, a Yellow Nape Amazon was adopted in December 2018 after his human dad passed away. Amazons are native to Central and South America and live for 50+ years. 5 year old Wally was adopted in December 2018. Doves and Pigeons live 30+ years in captivity. Mescal was adopted in November 2018. She is a parakeet who was transferred to CTPR from the MSPCA through our rescue-partnership. Parakeets are native to Australia and live for 10+ years. 12 year Scooby was adopted in October 2018! Eclectus parrots have very specific dietary needs and live for 40+ years. They are native to the Solomon Islands, Sumba, New Guinea and nearby islands, northeastern Australia and the Maluku Islands (Moluccas). 2 year old Blueberry was adopted in August 2018! Reyna was adopted with Mia in July 2018! Bree was adopted with Ariel and Dory in June 2016! She came to CTPR from MA through our rescue-partnership. Parakeets live for 10+ years and are native to Australia. 2 year old Lloyd was adopted in May 2018! Parakeets live for 10+ years and are native to Australia. 4 year old Alfie was adopted in April 2018! Fiona was adopted in March 2018 and gained a parakeet sister! Midori was adopted in February 2018 and made a new parakeet friend! 6 year old Oliver was adopted in February 2018 and gained some birdie siblings to keep him company! Good luck little man! Lovebirds live for 10+ years and are native to Africa. 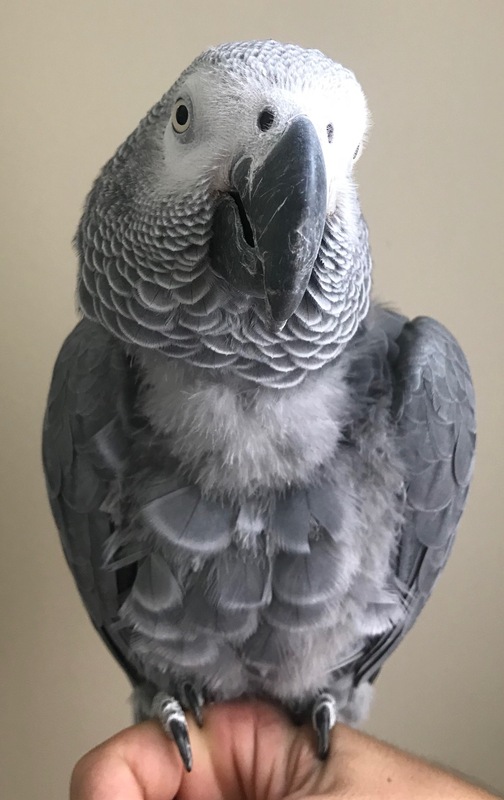 20 year old Paulie, a female Congo African Grey was adopted in December 2018! African Greys are native to Central Africa and live for 50+ years. ADOPTED DECEMBER 2018! Thea is a white pigeon who was found and cared for by a lovely family and then surrendered to us as soon as her disease testing came in. She is open to human interaction and is acclimated to living indoors (in a large cage) or outdoors (in a secure enclosure. 3 year old Sylvio (a Turquoise Green Cheek Conure) was adopted in November 2018. Green Cheek Conures live for 25+ years and are native to South America. 2 year old Chicklet was adopted in October 2018! Congrats sweet little girl! Cockatiels live for 20+ years and are native to Australia. 2 year old Butters was adopted in August 2018 and will be entertaining her new family with her acrobatic antics. Parakeets live for 10+ years and are native to Australia. Mia was adopted with Reyna in July 2018! Jenna was adopted in July 2018! Parakeets live for 10+ years and are native to Australia. 35 year old Cannibal was adopted in May 2018! Caiques live for 35+ years and are native to South America. 5 year old Tessa was adopted in May 2018! Senegals live for 35+ years and are native to Northern Africa. Curacao is a male parakeet, transferred to CTPR through our rescue-partnership, was adopted in April 2018! 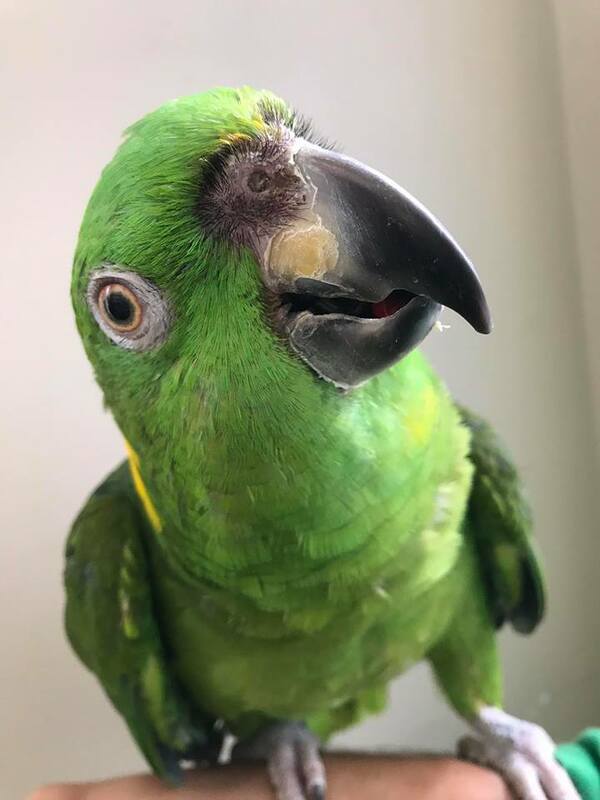 Buddy - a 19 year old Blue and Gold Macaw - was adopted in April 2018! Macaws live for 60+ years and are native to Central and South America. Logano was adopted with Nacho in February 2018! ADOPTED DECEMBER 2018! Avalon is a fancy pigeon who was found and brought to CTPR. She may be open to human interaction with more time and patience, but loves hanging out with her friend Thea. Avalon is acclimated to living indoors (in a large cage) or outdoors (in a secure enclosure. 6 year old Lovey/Lenny was adopted in November 2018! Blue Crown Conures live for 25+ years and are native to South America. 1 year old Jax was adopted in October 2018! Conures live for 25+ years and are native to South America. Howie was adopted in September 2018 and has a new best friend to sing with all day! Cockatiels live for 20+ years and are native to Australia. 38 year old Gawkie was adopted in August 2018! Goffin's cockatoos live for 40+ years and are native to Indonesia. 1.5 year old Sunny was adopted in August 2018! 20 year old Bandit was adopted in June 2016 and gained two new cockatiel brothers to sing to. Cockatiels live for 20+ years and are native to Australia. 12 year old Dustin was adopted in May 2018! Senegals live for 35+ years and are native to Northwestern Africa. Thunder and Bruce - who were transferred to CTPR through our rescue partnership - were adopted in April 2018! Cockatiels are native to Australia and live for 20+ years. Star and Bella, two fantastic 6 year old parakeets were adopted in February 2018! Marbles a 34 year old Mealy Amazon chose her loving family in January 2018! Yoshi was adopted in December 2018! Quaker Parrots live for 25+ years and are native to South America. 10 year old Bernie was adopted in November 2018! African Greys are native to Central Africa and live for 50+ years. Congrats to 30 year old Noogie on her adoption! 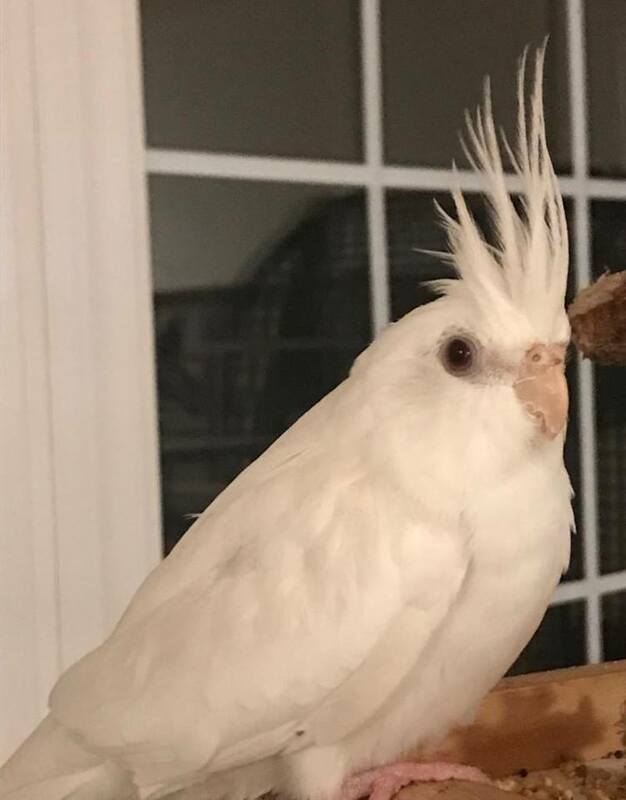 She is a wild caught Medium Sulfur Crested Cockatoo who was surrendered due to changing circumstances in her family's ability to continue to provide for her needs. Sulfur Crested Cockatoos live for 50+ years and are native to Australia and New Guinea. Olivia is a 18 year old female Eclectus who was adopted in August 2018! She is typical to her breed in that she is quite timid and nervous at first, but with patience, trust and treats she comes out of her shell. Eclectus parrots have very specific dietary needs and live for 40+ years. They are native to the Solomon Islands, Sumba, New Guinea and nearby islands, northeastern Australia and the Maluku Islands (Moluccas). 12 year old Squeaky was adopted in August 2018! Cockatiels are native to Australia and live for 20+ years. Lily was adopted in July 2018! She is an adult female parakeet who was found outside by one of our former adopters. Parakeets are native to Australia and live for 10+ years. Absinthe was adopted in June 2016 and gained a parakeet brother! He came to CTPR from MA through our rescue-partnership. Parakeets live for 10+ years and are native to Australia. 3 year old Ariel (white) and Dory (blue and yellow) were adopted together in June 2018! Parakeets live for 10+ years and are native to Australia. 9 year old Sunny (mom) and 8 year old Morpheus (daughter) were adopted in April 2018! Nacho was adopted with Logano in February 2018! Peanut and Sunshine were adopted in February 2018! 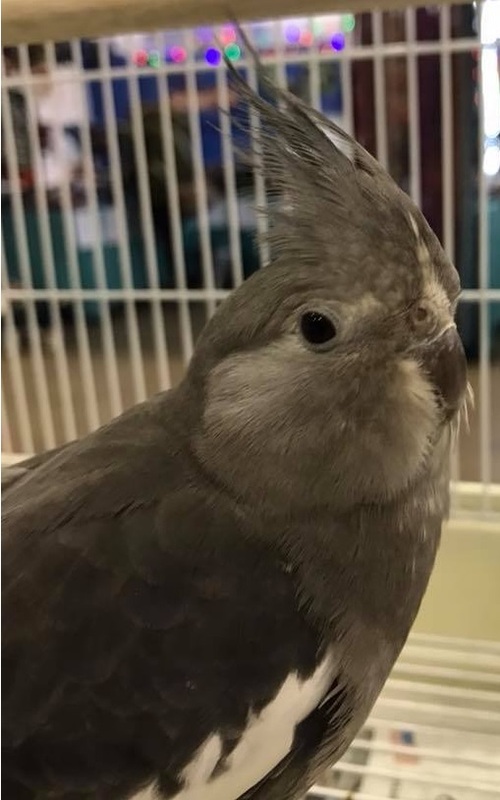 Dottie - a cockatiel - was adopted in January 2018! 23 year old Largo chose his new fmaily in December 2017!! 33 year old Louie was adopted in December 2017!! Congrats to Sonic who chose a new pal in December 2017! Chico was adopted in December 2017 and gained both a human and feathered brother! Congratulations to Buddy who chose his new mom in December 2017! Bean was adopted in September 2017! Goofy was adopted in September 2017!! Marley was adopted in July 2017! Congratulations to Storm who seamlessly moved into and started entertaining her new family with her antics in June 2017! Madison was adopted by a loving family in May 2017! Our lovely Gabby chose her new family in April 2017! Cricket was adopted in March 2017! Benji gained a very conscientious big brother in February 2017!! Soleil (and Sky) chose a family in December 2017!! Snowflake was adopted in December 2017! Congrats to Oscar who chose his family in December 2017!! Rico chose his family in November 2017! 14 year old Aurora was adopted in November 2017 and gained a 12 year old best friend!! Smokey was adopted in September 2017!! Sunny was adopted in August 2017!! Super sweet Kiki was adopted in July 2017!! Tula chose her loving family in June 2017!! Congrats to Lemon and Lime who chose their new home in May 2017! Crackle chose a loving big sister in May 2017! Pearl and Sundance (who is blind) landed safely with a loving home in April 2017! Jellybean was adopted in March 2017! Congratulations to Fred who chose his family in Januray 2017! Congrats to Pia who not only chose her mom in January 2017, but has also been recognized as an Emotional Support Animal and has been granted permission to stay on campus at the University of New Haven as an ESA animal!! Sky (and Soleil) chose a family in December 2017!! Winnie chose her family in December 2017! Gonzo was adopted in December 2017! Congrats to 7 month old Blue who chose his new mom in December 2017! Lance was adopted in October 2017!! Willow was adopted in September 2017!! Hoot was adopted in August 2017! Chase was adopted in July 2017 and gained a conure sister! Snap chose her loving family in June 2017! Congratulations to Paulo who chose a new mom and a parrot brother in May 2017! Elijha gained a loving sister for himself in April 2017! Roxie chose her family in April 2017! Heidi, Sally, Gus and Delaney found a luxury loft in March 2017!! Congratulations to Morty who chose his dad in January 2017! Pavarotti (and Patrick) from a home in December 2017!! Patrick (and Pavarotti) chose a family in December 2017! Congratultions to 21 year old Skylar who chose her family in December 2017! Indy chose his new family in December 2017 and gained a brother to play with! Peep was Adopted in September 2017!! Wargo was adopted in July 2017 and is entertaining his new family! The lovely Josephine was adopted in July 2017! 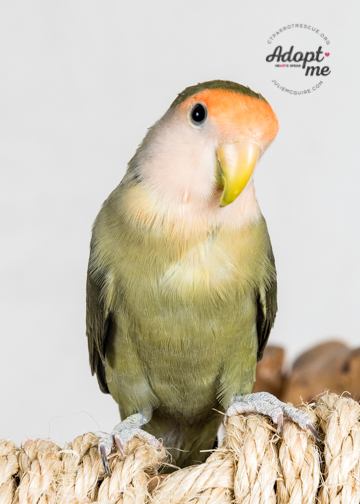 Pop was adopted in July 2017 and became a companion to an elderly male cockatiel. Chauncey chose her family in June 2017! Sunny chose his dad in June 2017!! Congrats to Banjo who chose his new family in May 2017! Ollie chose her dad and gained a sister (also adopted from CTPR in 2016) in April 2017! 6 Finches found their new home in April 2017! Chuckles was adopted in April 2017! Congratulations to Barnes & Noble on their adoption in December 2016! Coconut and Pip were adopted in November 2016! Congrats to Sunshine and Frosty who chose their loving family in November 2016! Congrats to Talum who chose his mom in October 2016! Congrats to Emmie who chose her mom and gained a parakeet sister in October 2016! Kyle gained a big sister in September 2016 who adores him and his confident personality!! Justin joined a loving family in August 2016! Poppy joined her new mom and dad in August 2016 and has been entertaining them with all his antics ever since! Rosie chose her loving family in June 2016. Ziggy was adopted in May 2016 and loves shower time! In May 2016 Phoebe joined Snow White and Isabella in their incredibly loving home! Luca (our splayed legged Parakeet) was adopted by and gained a very experienced veterinarian mom in April 2016! Congrats to Max who chose his family in November 2016!! Congratulations to Melba who chose a loving family to call his own in November 2016!! Congrats to Katie who chose her family in October 2016! Ruby was adopted in October 2016 and gained an Amazon brother! We are so happy that Cody chose her new family in September 2016!! PeeWee chose her home in August 2016 and she is being completely doted on! Bella was adopted in August 2016 and gained a parakeet sister! Congrats to little Padme who gained a big sister in June 2016 (as well as another parakeet sister)!!! In June 2016 Ravi chose his new dad who he has become inseparable from! Peppino chose her family in May 2016 and continues to flourish in her attentive home! 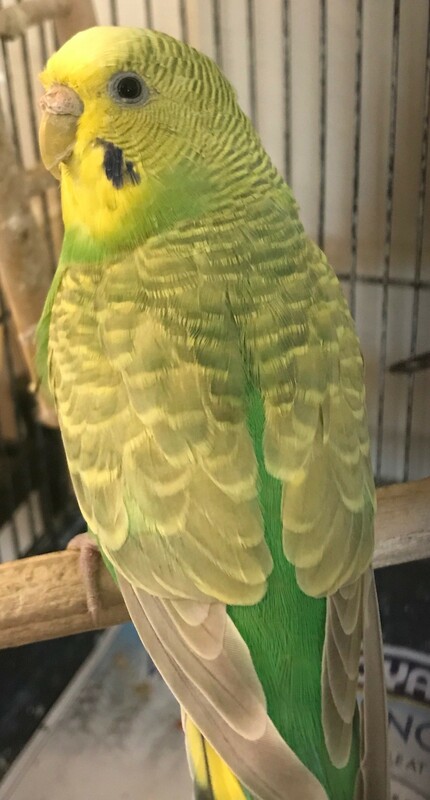 Wally (Senegal) was adopted by a loving mom and dad and gained some parakeet siblings in March 2016! Congrats to Twinkle who chose her big brother and mom in November 2016!! Congrats to Bopper who chose his lovely family in November 2016! Congrats to Smokey who chose his mom in November 2016 and is being super spoiled every day!! Congrats to Calla and Lilly (formerly Yvette and Leah) who were adopted in October 2016! Poppy was adopted in October 2016 and gained a cockatiel brother! Congrats to Beaker who chose his mom in September 2016! Iah became the apple of her dad's eye in August 2016! Louis gained two amazing sisters who have been doting on him daily since his adoption in August 2016! Freckles (now Nina) was adopted and joined her sister (Peppino) in August 2016! Amidala (now Sprite) found her new mommy in July 2016! Congrats to Haven and Pilgim who chose their family in June 2016! Harvest chose his new mom in May 2016 who has helped him gain confidence through consistent one-on-one attention. Our founding Quaker/Monk parrot Maxine was adopted and gained a loving mom and sister (sun conure) in October 2015!